Thursday, April 6, 2017 – Rhode Island has a long history of leading the way when it comes to taking a stand for the value of the arts and humanities in the civic life of our nation. Last week this tradition continued under the leadership of Rep. Jim Langevin (D-RI) who brought forward a Special Order on the floor of the House of Representatives to hear testimony in defense of the National Endowment for the Arts and the National Endowment for the Humanities. Both endowments face threats of elimination in the Trump Administration’s proposed FY18 federal budget made public in March. Congressman Langevin was joined by Rep. David Cicilline (D-RI) as well as five other colleagues from North Carolina, New Jersey, New York, and Illinois as they shared stories of impact from their home districts. 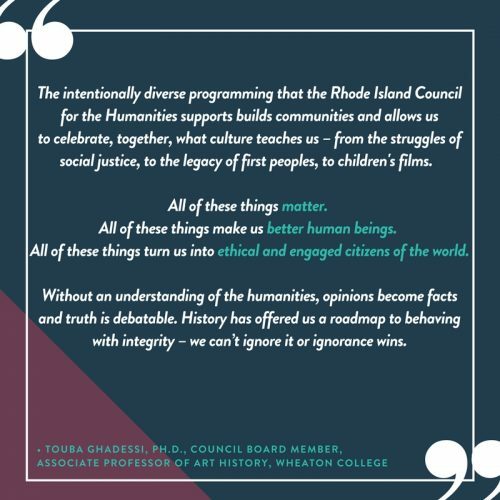 When the proposed budget was announced, the Rhode Island Council for the Humanities joined our colleagues at the Rhode Island State Council for the Arts (RISCA) in hosting four Cultural Conversations across the state with our senators and congressmen. These forums offered constituents the opportunity to share what potential cuts would mean to their communities and to the state’s economy. After nearly an hour of testimony, Rep. Langevin closed the Special Order by quoting Humanities Council board member and Wheaton College professor Touba Ghadessi. The Council is grateful to Rep. Langevin and his staff for organizing this effort and including testimonials shared by Rhode Islanders. If you want to share why the arts and humanities matter in your community, please send your story to rachael@rihumanities.org. You never know, your words may just end up in the Congressional Record! Click here, or on the video below, to watch the Special Order hour. Minute 00:00 – 07:23 Rep. Langevin opens the Special Order with a history of the National Endowments for the Arts and Humanities and the role of the late Senator Claiborne Pell in creating the 1965 Arts and Humanities Act. Minute 30:00 Rep. Cicilline begins testimony on the importance of the NEA and NEH in Rhode Island. Minute 54:03 Rep. Langevin thanks Elizabeth Francis, RICH and Randy Rosenbaum, RISCA for their leadership. Minute 58:35 Rep. Langevin quotes Council board member Dr. Touba Ghadessi.